We use Auto Refractometer to examine your eyes which is use to make measurement over a broad range. 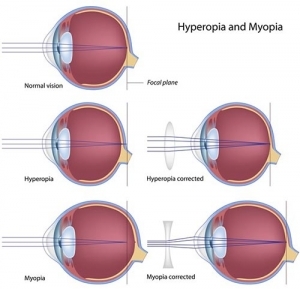 It can also measure the refractive errors of the eyes like myopia, hyperopia astigmatism or a combination of both. The monitor make the measurement results and setting image display on an easy-to-view screen. The PD will be automatically calculated after measurement. 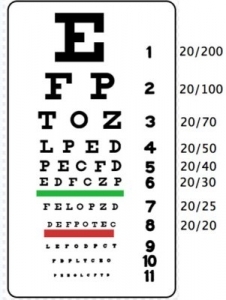 Visual acuity measures clearly the patient can see from the snellen chart and/or projector apparatus. This test enables the optometrist to distinguish orthoptic problem such as esophoria, exophoria, hypophoria and hyperphoria. The examiner asks the patient to look up and down, and to the right and left to see if the patient can move the eyes to their full extent. The examiner asks the patient to stare at an object, then quickly covers one eye and notes any movement in the eye that remains uncovered. The doctor checks the pupil’s response to light (if it dilates and constricts appropriately). The iris is viewed for symmetry and physical appearance. The iris is checked more thoroughly later using a slit lamp. The examiner will determine the refractive error and obtain a prescription for corrective lenses for people whose visual acuity is less than 20/20. The clearest, lightest and toughest lens. 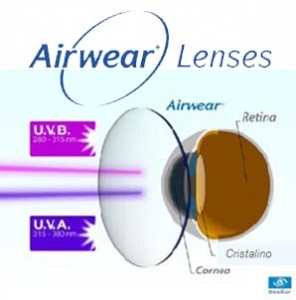 Airwear has become the No.1 selling Polycarbonate in the US and is rapidly growing in popularity in EUROPE and Asia. Eye-care professionals appreciate it for its Image Quality, Lightness, Flatness, Thinness and Superior Impact Resistance. Up to 43% lighter than standard plastic lenses. This provides the wearer a unique visual comfort. aesthetically to achieve a natural outlook. 100% protection against UV. This provides additional protection against harmful rays. Superior Impact Resistance Made from the same materials used in air craft windshield. 12 times stronger shock resistance compared to standard plastic lenses. Passed the most stringer European and US FDA Impact resistance tests. This lenses is strong and unbreakable in most circumstances. Easy clean and superior scratch resistance. Sharpness & comfort in vision with over 99% light transmission. Now wearers can enjoy the suppression of unwanted reflection and glare. Lens that automatically darkens when outdoors and lightens when indoors. Advancing technology and demanding lifestyles increasingly expose us to the harmful effects of Ultra-Violet(UV) light and Electro Magnetic Interference(EMI). Whether we are outdoors engaged in our favorite sport or indoors using our computers our eyes are exposed to electro magnetic radiation. Today, we have Greymatic Photochromic Lenses that provide full UV and EMI protection for our eyes. shielding our eyes from the damaging effects of EMI. It helps protect your eyes from damaging UV rays and glare. Exposure to the suns UV rays is one of the greatest dangers to your vision. Research shows that long-term, unprotected exposure to UVA and UVB radiation can lead to serious eye conditions, such as cataracts etc. Help protect your kids eyes also. Everybody needs eye protection, but kids are especially vulnerable. They spend more time outdoors, and their eyes are more sensitive to UV rays. In fact, 80% of lifetime sun exposure occurs before age 18. The sooner you can reduce the risks, the better. Varilux is the worlds most prescribed progressive lens. Varilux lenses are made so that you get effortless sharp vision at every distance, from far to near and in between, unlike other means of correction. It is especially suitable if you are in your 40s or if you need outstanding vision on the sides or in dynamic situations, like playing golf, driving or simply walking down the street. It is an excellent all-purpose lens and very comfortable to wear. Essilor Anti-Fatigue lenses are a patented design advanced single vision lens specially designed to relieve the symptoms of visual fatigue. The lenses support the wearer’s accommodation efforts with an additional plus power at near vision (+ 0.60 D) and with instant adaptation. This provides a greater level of comfort for the wearer as the natural accommodation pattern is retained. Essilor Anti-Fatigue lenses were used in exactly the same way as their current spectacles (constant or occasional use). Adaptation was as fast and easy as with a standard single-vision lens. 94% of wearers were totally satisfied with regard to near, distance and dynamic vision alike. Designed to help you see more clearly. Multicoated lens eliminates virtually all the irritating reflections that appear on the front and back of the lens, so you’re less likely to suffer eye strain. With multicoated lens, 99% of light is allowed to pass through the lens, improving your vision. That’s why you are far less likely to be distracted by the fuzziness around car headlights that can blur your vision. So driving at night is much safer. You’ll also see better when working at a computer screen, watching television, playing a sport or reading in bright light. It significantly more scratch-resistant than uncoated lens. So your multicoated lens will last longer as they’re likely to be damaged by everyday wear and tear. Multicoated lens is also tough on smudges, dirt marks and moisture. They simply can’t get a grip on the lens surface. This not only helps prevent staining but means lenses are easy to clean and need cleaning less often. High-index lens materials offer the highest quality technology available in spectacle lenses. Nikon pioneered this technology by introducing the highest index plastic material available 1.74. Our advanced aspheric technology also provides thinner and flatter lenses that wont bulge unattractively and are best suited for shallow, high fashion frames. Color Blindness, or Color Vision Deficiency, is an eye condition where a person is not able to distinguish certain colors or shades of colors to some degree. Color Blindness does not mean that a person can only see black and white. A person with color blindness is able to see different colors, however they are not able to see some colors due to deficiencies in the eyes. Color blindness is a hereditary condition but can also be caused by eye diseases, damage to the retina and macula, and aging or when the lens is darkened over time from a cataract. Although there is no absolute treatment for hereditary color blindness, there are methods, techniques, and special glasses that may help people with color blindness differentiate different colors but not truly see them. Special enhancement lenses are effective glasses for color blindness. These lenses are most effective at correcting red and green color deficiencies. While glasses for color blindness are not as effective at correcting the inability to see blue and yellow, some patients see adequate improvement with their use. The glasses are not able to create any permanent improvements in color blindness, but are effective at changing the eyes’ ability to sense different colors. Since color blindness is considered to be a genetic disorder, regular prescription glasses are not effective. In the late 1990s, special color lenses were developed to help individuals who suffered from a red and green color deficiency. These glasses for color blindness are effective at bringing out shades of red and green. 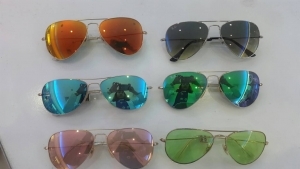 They also help bring a brightness to shades that individuals with color blindness typically see as faded. Some individuals may not find glasses for color blindness effective. While most colorblindpatients suffer from an inability to distinguish between reds and greens, the small percentage of patients who are not able to discriminate between yellow and blue hues will see little benefit from these types of lenses. Those with extreme cases who are only able to see shades of black, grey and white will not gain any benefit from glasses for color blindness. It is important that patients realize that glasses for color blindness will not give them 100 percent normal eyesight. These lenses increase the differences between different shades. They make it more likely that those with color blindness will be able to see an enhanced version of the colors they find it difficult to distinguish. In order to be as effective as possible, only one special enhancement lens is worn. This allows the brain to process the fact that the eyes are actually seeing separate colors. If both eyes look through the special enhancement lenses with the same tint, the same level of color blindness will remain. Some individuals choose to use two lenses, but each one has a separate tint, which has proven to be just as effective as using one tinted lens. When glasses for color blindness are worn, there tends to be an improvement in only certain areas. Other aspects of patients’ visions may be compromised by their use. For example, most are not able to wear the lenses while driving since they impair the ability to judge distance in low light conditions. Fluorescent and three-dimensional effects may also be seen when using the lenses. The slit lamp is an instrument consisting of a high-intensity light source that can be focused to shine a thin sheet of light into the eye. It is used in conjunction with a biomicroscope. The lamp facilitates an examination of the anterior segment, or frontal structures and posterior segment, of the human eye, which includes the eyelid, sclera, conjunctiva, iris, natural crystalline lens, and cornea. 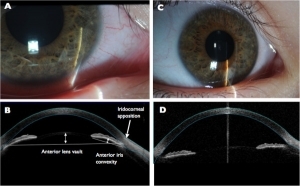 The binocular slit-lamp examination provides stereoscopic magnified view of the eye structures in detail, enabling anatomical diagnoses to be made for a variety of eye conditions. Adults need no special preparation for the test; however children may need some preparation, depending on age, previous experiences, and level of trust. Have Questions About Dental Or Optical?